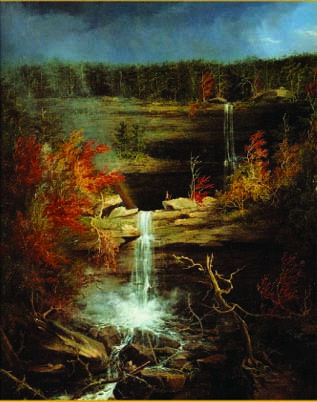 The Mountain Top Historical Society’s Art Trail Interpretive Center, Kaaterskill Falls and the site of the Catskill Mountain House are all stops along the Hudson River School Art Trail. The trail recreates for visitors today the views painted yesterday by the Hudson River School artists and includes the homes of artists Thomas Cole in Catskill and Frederick Church in Hudson. Trail sites are within a 15-miles radius and are accessible by both auto and foot. Trail Site 1 Thomas Cole Historic Site*— Home and studio of the artist Thomas Cole, 218 Spring Street, Catskill. Trail Site 2 The Olana State Historic Site*— Home and work place of artist Frederick Church, Route 9G, Hudson. Trail Site 3 Catskill Creek— Scenic view, west side of Route 9W, Catskill, 1000 ft. past Jefferson Heights ramp. Trail Site 4 Kaaterskill Clove— NYS Scenic Byway, Route 23A , 2 miles west of traffic light in Palenville. Trail Site 5 Kaaterskill Falls— Scenic view, Route 23A, four miles west of traffic light in Palenville. The Mountain Top Historical Society* Art Trail Center and historic 1913 Train Station are located on Route 23A, on the right, 2.5 miles from Kaaterskill Falls, a favorite destination of the Hudson River School artists. The Mountain Top Historical Society campus is located at the top of Kaaterskill Clove, just a couple of miles from the site of the famed Catskill Mountain House. The footprint of what was once the grandest hotel in country is in North-South Lake Public Campground, two miles from the MTHS campus, down North Lake Road. Although the hotel has been gone for 50 years, the panoramic view of the Hudson can still be seen from the wide ledge overlooking the river. Trail Site 6 North-South Lake — Scenic view, bear left, then right at first stop sign past gatehouse, park by recreation center. Trail Site 7 Sunset Rock— Scenic view, access off North Beach parking area, left on the blue-blaze escarpment trail. Trail Site 8 Catskill Mountain House — Scenic view, access off North Beach parking area. Walk towards picnic pavilion, away from lake, then walk up the hill. *Art Trail maps with complete directions are available at these locations and at the Greene County Visitor Information Center, Exit 21, NYS Thruway, Route 23, Leeds, NY.